Are you looking for images showing what Uplighting vs. No Uplighting looks like? How many times have you walked into a wedding venue and were told, “we have uplighting, no need to get it somewhere else”. If you believe that all lighting is the same and it doesn’t matter, then there really is no need to shop around for wedding uplighting. 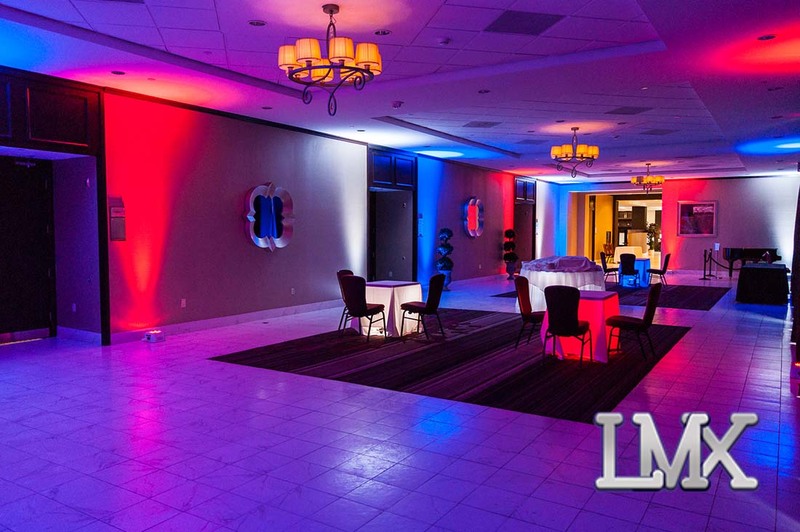 Most people don’t realize that uplighting varies a lot from one vendor to another. Most basic DJs carry cheap lighting just to help them get a gig. The rest of this article will describe what professional uplighting is and why you want it for your wedding reception. In addition you will find some uplighting vs no uplighting examples. Uplighting and vehicles have one thing in common, it’s their variation. When you ask a wedding vendor, “do you have wedding uplighting”? This is similar to asking someone, “do you have a car”? You already know that not all cars look the same or offer the same experience (e.g. Mercedes Benz vs. Hyundai). The same goes for your event lighting rental (Hint: don’t rent, get a professional all-inclusive service). antitative value for how bright lights are. You need to consider the distance with lux because the lux value directly in front of a light is brighter than at a farther distance. Think of a flashlight, isn’t it really bright when someone close to you points it in your face? Isn’t that same flashlight much dimmer from a distance? The cheapest uplighting fixtures are less than 500 lux @ 2 meters. Let’s talk about color variations with uplighting (i.e. the number of colors that are offered). Most DJs and wedding venues that offer uplighting only offer the 16 basic colors that are pre-programmed into the fixture. Professional uplighting offers about 275 trillion different colors because professional lighting vendors know how to mix colors and program the fixtures to exactly match any color in your color scheme or color palette for your wedding. 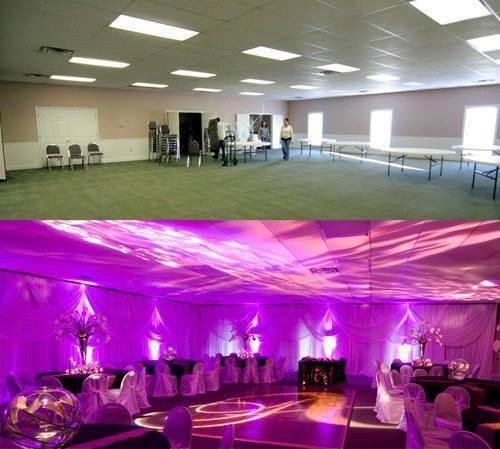 This means that your uplighting can the exact same color as your bride’s maid dresses or anything else in the room. What about color patterns? Maybe one color doesn’t fully describe your style or vision at your wedding. Cheap uplighting services only offer one color (i.e. all the fixtures are the same color at the same time). 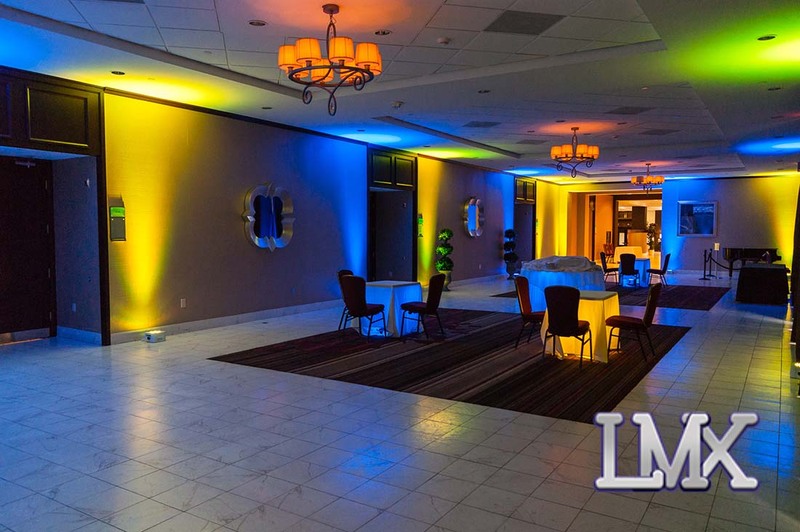 Professional uplighting services are able to program uplighting fixtures so that each fixture can be a different color. If you’re not sure how to select colors for your wedding, we recommend using the color tool on the Adobe website as it will select colors that look great together. Another thing to watch out for is the inferior cell phone app. Some cheap wedding vendors use a mobile app to control all their lighting. They use a mobile app because they don’t know how to properly program their lights. Professional uplighting services use a lighting console or computer-based console to program their lights. What are the technical questions you need to ask potential wedding vendors? Here is a quick list of questions. Any professional service will understand these questions. If an event lighting service doesn’t understand or sounds confused, then you’re dealing with someone offering inferior services. How bright are your uplighting fixtures? Are you able to DMX control your lighting? Can you program your lighting so that fixtures can be different colors at different times? Can you program your uplighting so that all the fixtures change color in sync with the music together? In summary, remember that not all uplighting is the same. 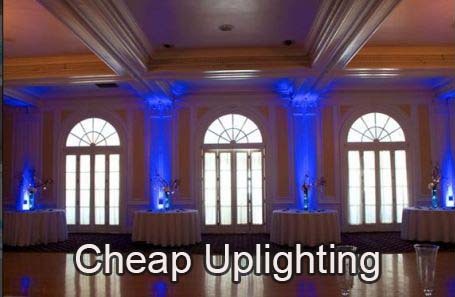 Cheaper wedding uplighting rentals will make your venue look just that, CHEAP. All those pretty pictures of uplighting in wedding magazines were created using professional uplighting. Look at Uplighting vs. No Uplighting examples and see the difference it makes. If your vision is to have your venue look anything like the pictures in those wedding magazines, you need professional uplighting. Wedding venues with pre-installed lighting cannot perform at the same level as professional uplighting. 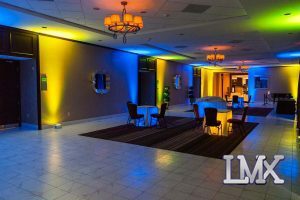 You might want specific colors and want your uplight to behave with more energy at specific times during your wedding. 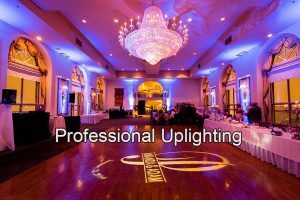 You need professional uplighting along with a lighting specialist to control your lighting to get the full unforgettable experience.